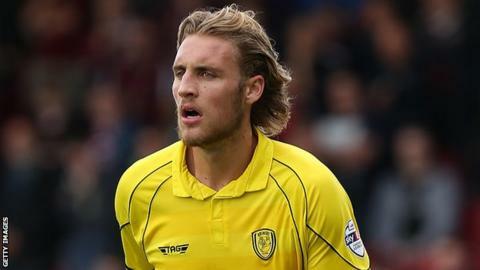 George Taft scored the first goal of his career to give Burton a narrow win over promotion rivals Shrewsbury. The defender steered a half-volley into the bottom-right corner from 12 yards following Matthew Palmer's corner. Shrewsbury dominated the first half as Jon McLaughlin saved two James Collins headers and Bobby Grant's shot. After the goal, Burton's Kelvin Maynard shot wide and hit the legs of Shrews keeper Jayson Leutwiler before Mickey Demetriou blazed over for the visitors. The victory for Jimmy Floyd Hasselbaink's Brewers sees them leapfrog Shrewsbury into second place in League Two, a point behind leaders Wycombe. "They came here to beat us and were ready for the battle but my boys were ready for them as well. I think Shrewsbury is a very very good side and they gave us a lot of questions to answer and luckily we could answer them at times. Sometimes they gave us problems but they are a good team and you have to respect them. We did respect them and I must say we looked a unit, we looked very hard to break down and at times, when we had the ball, we looked to give them problems. We were very calm on the ball and looked like we were getting chances. I was very happy with the performance and the points"
Match ends, Burton Albion 1, Shrewsbury Town 0. Second Half ends, Burton Albion 1, Shrewsbury Town 0. Philip Edwards (Burton Albion) wins a free kick on the left wing. Substitution, Burton Albion. Ian Sharps replaces Matthew Palmer. Attempt missed. Andy Mangan (Shrewsbury Town) right footed shot from outside the box misses to the left from a direct free kick. Scott Vernon (Shrewsbury Town) wins a free kick in the attacking half. Foul by John Mousinho (Burton Albion). Substitution, Burton Albion. Adam McGurk replaces Kelvin Maynard. Attempt missed. Mickey Demetriou (Shrewsbury Town) left footed shot from the centre of the box is too high. Corner, Shrewsbury Town. Conceded by Damien McCrory. Corner, Shrewsbury Town. Conceded by Philip Edwards. Attempt missed. Andy Mangan (Shrewsbury Town) right footed shot from the left side of the box misses to the left. Attempt blocked. Joshua Passley (Shrewsbury Town) right footed shot from the centre of the box is blocked. Substitution, Burton Albion. Dominic Knowles replaces Stuart Beavon. Foul by Ryan Woods (Shrewsbury Town). Foul by Jacob Blyth (Burton Albion). Attempt missed. Ryan Woods (Shrewsbury Town) right footed shot from outside the box is just a bit too high. Connor Goldson (Shrewsbury Town) wins a free kick in the defensive half. Substitution, Shrewsbury Town. Andy Mangan replaces Liam Lawrence. Attempt saved. James Wesolowski (Shrewsbury Town) right footed shot from outside the box is saved in the centre of the goal. James Wesolowski (Shrewsbury Town) wins a free kick in the attacking half. Attempt missed. Liam Lawrence (Shrewsbury Town) right footed shot from the left side of the box is close, but misses to the right. Jacob Blyth (Burton Albion) is shown the yellow card. Joshua Passley (Shrewsbury Town) wins a free kick on the right wing. Attempt saved. Kelvin Maynard (Burton Albion) left footed shot from the centre of the box is saved in the bottom left corner. Substitution, Shrewsbury Town. James Wesolowski replaces Mark Ellis. Attempt missed. Kelvin Maynard (Burton Albion) right footed shot from the centre of the box is close, but misses to the left. (Burton Albion) wins a free kick in the attacking half. Goal! Burton Albion 1, Shrewsbury Town 0. George Taft (Burton Albion) left footed shot from the centre of the box to the bottom right corner. Assisted by Matthew Palmer. Corner, Burton Albion. Conceded by Nathaniel Knight-Percival. Corner, Burton Albion. Conceded by Ryan Woods. Attempt missed. James Collins (Shrewsbury Town) right footed shot from outside the box is too high.